A RARE poster advertising the return journey of the ill-fated ship Titanic has been sold at auction for £62,000. It was sold on Saturday at the Titanic, White Star and Transport Auction of Henry Aldridge & Son in Devizes, Wiltshire to a collector, reports the BBC. The auctioneers say the rare broadside poster advertises ‘the voyage that never happened’. It lists the Third Class tariffs for the ship’s return voyage from New York to Europe on Saturday, April 20, 1912, with prices starting at $36.25. Unfortunately the Belfast-built ‘unsinkable’ ship sank five days earlier on April 15, 1912 after hitting an iceberg during its maiden voyage from Southampton to New York. The poster actually features photographs of the Titanic’s almost identical sister ship, the Olympic, which was often used for promotional material. 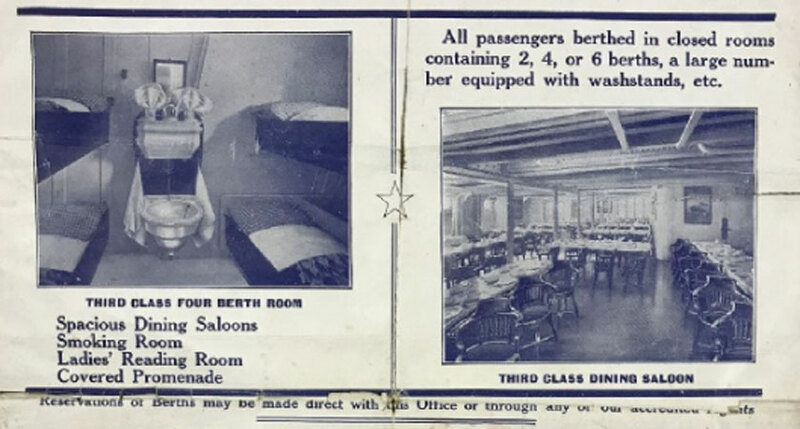 They show the inside of a Third Class cabin and the Third Class dining facility. The listing claims Titanic’s owners, White Star Line, destroyed as many of the posters as possible following the sinking, making this one extremely rare. It is believed only a handful exist today, either in museums or private collections, one of which was on display at the Victoria and Albert Museum’s recent Speed and Style exhibition. In April, Henry Aldridge & Son sold a menu of the first meal served on board the Titanic for £100,000. Last October they also sold a letter from a Titanic victim to his wife and unborn child, while in 2014, they auctioned the last ever letter written on the Titanic for £119,000.